Purchase products and services through the Internet has become a normal activity for customers due to the rise of online shopping and loss of fear of using means of payment through internet. And it is with the rise of digital consumers and the requirement of immediacy of information with mobile devices, customers feel uncomfortable and blind once they buy and must wait until the appointed day delivery without any news until the purchase He arrives at his home. 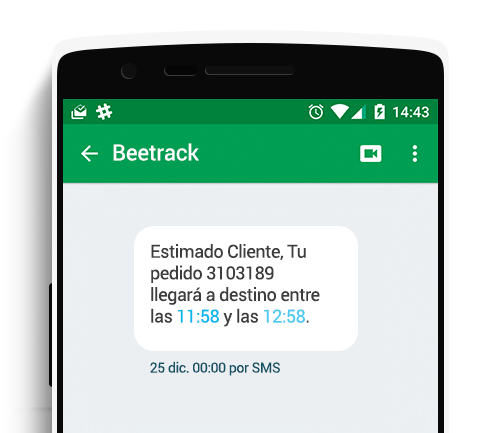 Beetrack is why, in order to improve the experience in the process of tracking shipments, has implemented a system notifications via email and SMS for the customer knows his office status. Home Route: This notice is automatically sent when the carrier or dispatcher start the route in the mobile application to alert the customer that his office will arrive in a time range which can also be configured in the application. At the start of their working day, the dispatcher log on to the mobile application and select the assigned route for the day. Clicking on ” Start Directions ” a notification for announcing that his office is on its way and will arrive in a margin of time will trigger client. You can also view the approximate location of the mobile if it is configured in the application. As delivery shipments, the carrier may notify directly by pressing a button in the application that the customer is next on your list, this notice called ” Pre-delivery ” send an SMS or email so that the client is prepared to receive it Your domicile. This simple action will considerably reduce deliveries to state ” Undelivered ” finding no customer at home, according to our statistics up to 25%. Finally, once he delivered the office, the carrier will complete the office test form and complete the process automatically send a notification about the status of this, in this case a successful delivery with a satisfied customer. Design messages and emails are fully customizable. They can be sent to customers and your internal team. Show the approximate location of the truck when in route (offices with “pending” status). And many other features that can check this link . Beetrack enable notifications and increases the quality of your logistics operation.